Thanks to Plum Organics for sponsoring my post about fun kid photos and the stories behind them. Enter Plum's "Babies for Yum Caption Contest on Facebook and you could win a $100 gift card or Plum goodies. 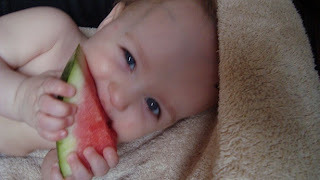 This was her first piece of watermelon. She swiped it from her daddy. It was a hot Summer night and we decided to slice open the nice cool melon in the fridge. Capri had just gotten out of the shower and was all squeaky clean. He wasn't paying close attention, but she was. Attracted to the pretty colors and sweet scent, she grabbed ahold with both hands and like everything she gets ahold of, it went straight to her mouth! It was love! She laughed and giggled and was so proud of her self for finding something so wonderful. I ran and got my camera. Needless to say, she got right back in the shower! She has also been working on the art of grabbing - sometimes it's a very rewarding thing! We started her with fruits and veggies. I like to make her foods at home so that I know she's getting fresh, organic produce. Plum Organics has been a huge help. When I'm on the run, or don't have any foods made, I can trust that giving her Plum, is giving her the best, nutrient rich, all natural, organic foods just like I prepare at home. I was selected for this sponsorship by the http://www. clevergirlscollective.com > Clever Girls Collective, which endorses http://www.blogwithintegrity.com >Blog With Integrity, as I do.